It's author week here on Life, Unedited, and I have three authors to feature. Today is an interview with Lisa Dunster Moeller, reposted from the Authors Promoting Authors blogsite. 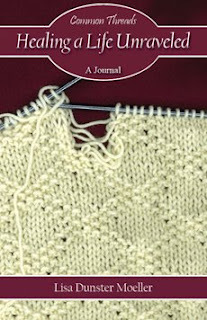 What are the ‘Common Threads Journals? They are a unique line of journals that were created as a tool to help people connect with one another. Each journal has a unique theme, but all are meant to be shared and have more than one owner. They use journal writing as a way to identify the common threads we share with the people around us, and then allow us to connect with those people by sharing the journals and our thoughts and feelings that are contained within them. How did you come up with such an original concept? It was a combination of things. The driving force behind the idea was my desire to help two friends who were suffering from the pain caused by divorce. Having been through a divorce myself, I expected that I would be able to relate to them in ways that others couldn't and could perhaps even help by sharing my experience with them. What I learned was that although I could truly empathize with their pain, the advice I had to offer wasn't always what they needed to hear. It occurred to me then that what I really needed was a way to collect all the things other people had said to me during that difficult time in my own life and pass those bits of wisdom on to them in a way that allowed them to choose what they wanted o n their own terms. That’s essentially how the fist Common Threads Journal came to be. You have expressed your concern over a “great disconnect” in our society. What do you mean by that? It is my way of describing the barriers that we each create in order to shield ourselves from the daily assault of negative images we receive through the media. It's something we all do to keep the bad news from taking over our hearts and minds, but it also causes us to isolate ourselves. As a society we have become desensitized. The unfortunate result of that protection mechanism is that we become disconnected from more than just the negative images in the media; we begin to disconnect from our neighbors and community members (both locally and globally). After awhile it becomes easy to ignore and pass up the opportunities we have to make small positive changes in the lives of others. How do you hope Common Threads Journals can help overcome this problem? I believe that even the smallest of solutions can have an impact on the biggest of problems. I certainly don't expect to fix the world with this idea, but I do believe the journals will help people to create connections with one another that inspire them to express caring and compassion instead of fear or indifference. What is the most important message you want these journals to convey to others? We all have something to contribute to this world; reaching out to others, connecting and sharing a piece of your own life story is something we all can do to help bridge the gap of the "great disconnect." Do you have plans for more journals? Yes, I have plans for several more journals in the series. I am currently working on a journal for recording life's milestone moments. After that, I want to create a journal for creating lasting connections between loved ones who are separated by distance.